Time travel to the year 2052 and battle in the F36000 anti-gravity racing league with the TOTAKU Wipeout Feisar FX350 Ship. Released in 1995, this iconic game and craft collection captured the hearts of many gamers. 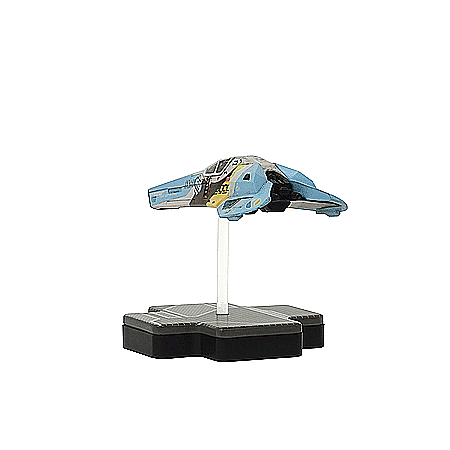 Floating on a clear beam, display your ship allowing it to hover among your collection. Don’t miss out and shop the TOTAKU Wipeout AG SYS Ship today. Wipeout is a futuristic racing game first released in 1995 and quickly became a popular game. Wipeout became so popular because of the fast-paced gameplay and 3D visual design which took the hearts of many. Wipeout 2097 was voted as one of PlayStation’s best games. Embrace the nostalgia and shop the TOTAKU Wipeout which is the popular Feisar FX350 Ship which you could use in an anti-gravity race. Each of the TOTAKU figures are 10cm tall and highly detailed. The unique cross-shaped base offers a sturdy and durable fixed base which the characters stands on. Give your TOTAKU Wipeout personality with the many ways to display the figurine! Shop the TOTAKU Wipeout today and add to your collection.